The Auto-Go car motor-racing game. Homepage. This page: A simple motor racing board game by H.P. Gibson & Sons Ltd of London. This old game turned up a few years ago. 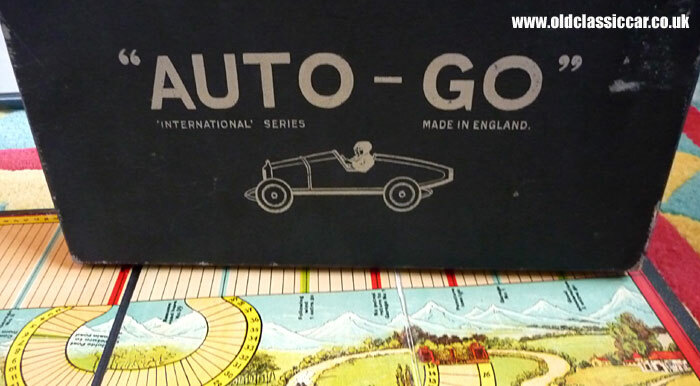 Called Auto-Go, it was produced by games firm H.P. Gibson & Sons Ltd of London, my guess would be in the mid-1930s. The box shows some signs of age to it, not surprising given that its earliest years were no doubt in the hands of an excited, and perhaps non-too-careful, young child. 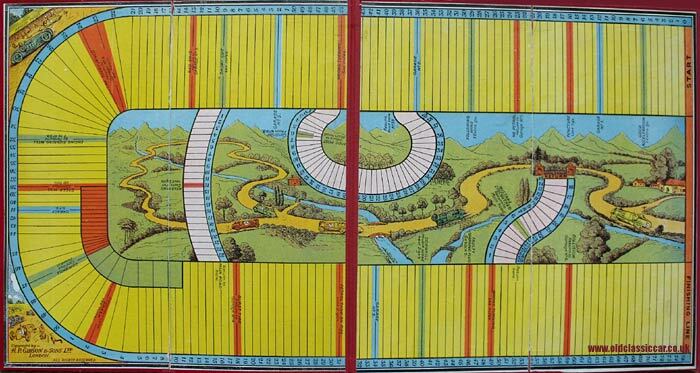 The game board inside though is in great condition, and fold out to reveal a road racing circuit, with illustrations of cars zooming around quiet country lanes, in chase of the chequered flag. 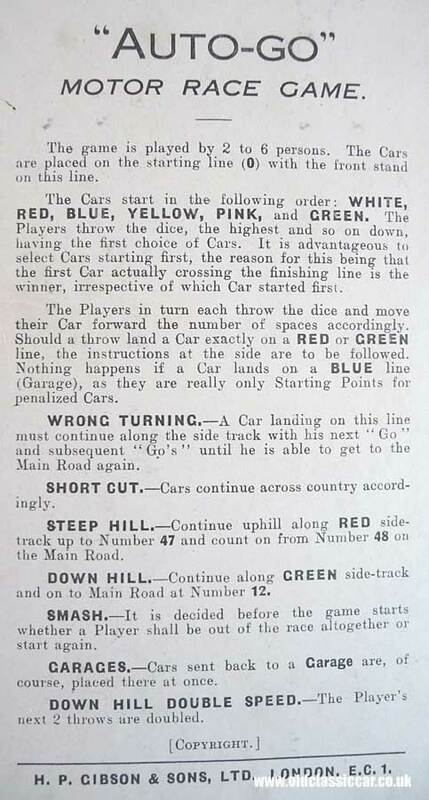 Players line up at the start, represented by painted lead racing cars, and take turns to roll the wooden dice. Various hazards and obstacles are included on the board, including wrong turns, overturning the car, a smash on a dangerous curve, and a burst tyre to name just some of the problems the driver may encounter. Unfortunately I don't have the instruction sheet for my board game, but in 2012 I was sent a scanned copy (further down this page). To the top left of the board, there is an illustration of a 1930's racing car overtaking a similar machine sat in the pits, while at the bottom left corner there is another racer - maybe an ERA - having its wheel changed. Top stuff! A 1920's version of the game. Mark contacted me and sent over photos of an earlier example of Auto-Go that he bought online. 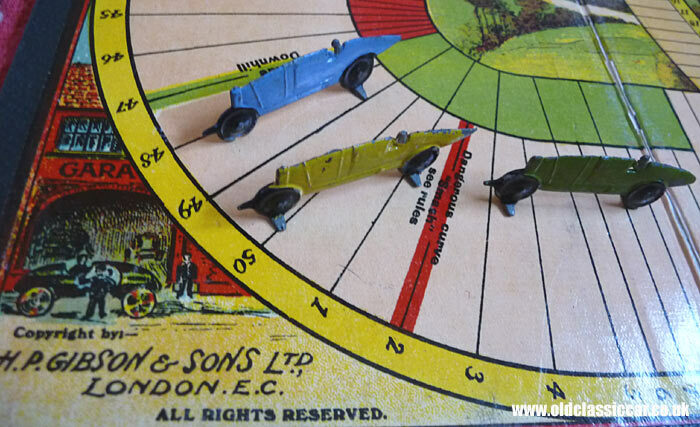 The game appears to be broadly the same as mine, although the board features slightly different artwork - as the images below show - and also a different style of racing car. The earlier box is a simple black affair, with a line drawing of a racer on its lid, whereas mine features a more colourful illustration. The playing pieces in Mark's set are very reminiscent of open-wheeled single seat racing cars of the era, while those in my set echo the streamlined racers and land speed record cars of the 1930s. The pit stop scene at the bottom left corner of my board, on the earlier example is replaced by a garage scene with a car parked outside it. He also sent over a scan of the original instruction sheet, which - for anyone wishing to play their own copy of the game - can be found by clicking here. Thanks Mark. H.P. Gibson & Sons Ltd, makers of "Auto-Go". The firm that produced this game came into being in 1919, producing many games such as Auto-Go and Dover Patrol prior to WW2. Unfortunately the Gibson's premises were bombed during the Blitz. Not to be put off by a minor issue such as losing their entire factory, the sons of the original company founder re-built the firm following the war. Happily, Gibsons Games (as they are now known) is still in business, and is still a British company no less. 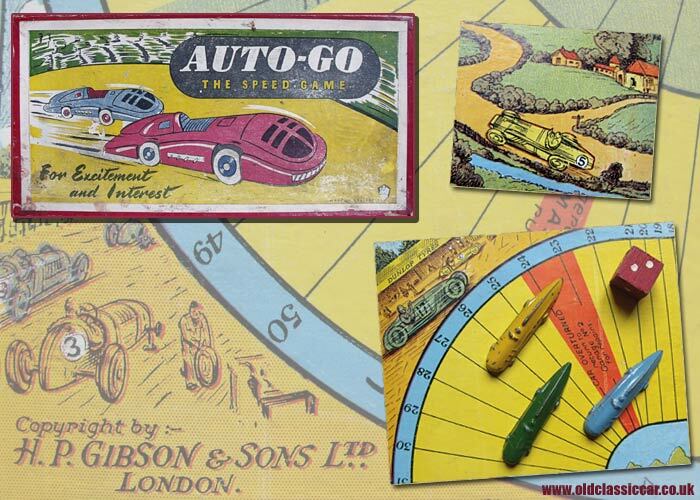 They continue to produce traditional games and puzzles, some of which have a motoring theme to them. 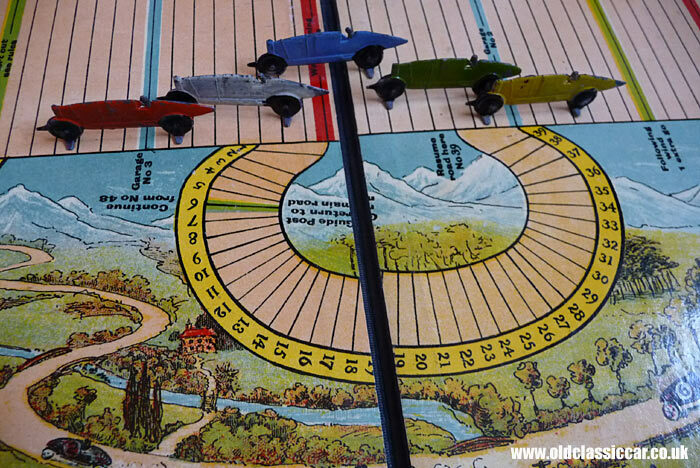 Return to the car-related games section, where more motoring games - such as Duncan Hamilton's Oulton Park driving game, and a 1950's racing board game are described in detail.